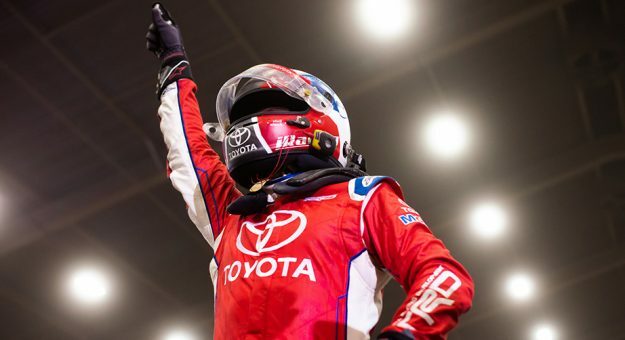 Christopher Bell entered the record books Sunday morning by becoming just the second driver in Chili Bowl history to win the prestigious dirt Midget race three consecutive years. His performance this week in Tulsa, Oklahoma, was one for the ages. Bell, who drives for Joe Gibbs Racing in the NASCAR Xfinity Series, didn’t lead the 24-car A-Main championship race until the final turn of the final lap. The Oklahoma native took advantage of leader Kyle Larson getting stuck in traffic, then beat the full-time Monster Energy NASCAR Cup Series driver to the line in an epic last-lap finish after Larson oh-so-slightly mishandled the final lap. For Larson, it was heartbreak for the second consecutive year. The Chip Ganassi Racing driver was leading late in last year’s race, too, when engine issues forced him to retire with 10 laps to go. That opened the door for Bell to win his second consecutive event in 2018. A dejected Larson approached Bell during the winner’s celebration and shook his hand, but the disappointment was evident as pics rolled in on social media. In addition to becoming the second driver to win three consecutive Chili Bowls, Bell is just the third to win three overall since the event began in 1987 — and he’s the only one without the last name of “Swindell.” Sammy Swindell is the all-time leader with five Chili Bowl wins. His son, Kevin, has four, including four in a row from 2010-2013. Justin Grant finished third, followed by Brady Bacon and Zach Daum to complete the top five. C.J. Leary took eighth in an Alex Bowman-owned car, with 2018 NASCAR Next product Tanner Thorson finishing 10th. The Chili Bowl is an annual dirt Midget race that has been held since 1987 and always draws interest from some of auto racing’s most talent drivers. The week-long event boasts six days of practice and qualifying events to set the 24-car field for the main event, all of which culminated Saturday — and eventually, early Sunday morning — in a full day-plus of racing. Saturday’s action is known as “Alphabet Soup” as drivers who had not previously qualified for the championship race had to drive their way in through a series of transfers, starting with two O-Feature races. The top-six finishers from each O-Feature event advanced to the corresponding two N-Feature races (in which there were already several drivers qualified). Then the top six finishers from each N-Feature race advanced into the M-Feature races, where other drivers were also waiting. The format was used all the way up to the A-Main finale, although the number of drivers advancing upward dropped to five starting at the G-Feature, then jumped to seven for the B-Feature races. Drivers also could qualify for the A-Main throughout the week, which Larson, Bell, Logan Seavey, Tanner Thorson and Rico Abreu, among others, did. Brad Sweet, Larson’s brother-in-law, won the first B-Feature, a superbly contested 20-lap event that also saw Roush Fenway Racing’s Ricky Stenhouse Jr. advance to the main event by finishing fourth. Sweet would finish seventh in the title race, with Stenhouse Jr. taking 22nd. • Chase Briscoe, who will drive full time for Stewart-Haas Racing in the NASCAR Xfinity Series this year, missed making the A-Main by an agonizing one position. He finished eighth in the first B-Feature — the top seven advance. Stings so bad missing this race by one spot. You wait all year for it and it’s so hard to put yourself in position to even make this race. Gotta wait a whole other year to get redemption. • Hendrick Motorsports driver Alex Bowman, in the Chili Bowl as both a driver and as the owner of a car, started the day in the C-Feature based off his performance throughout the week. But Bowman slapped the wall with just a couple of laps to go, dropping him from third to seventh at the checkered — and the top five advanced into the B-Feature. His car made it to the championship, though, after driver C.J. Leary piloted it to victory in the second B-Feature. • Obaika Racing’s Tanner Berryhill, in contention for Sunoco Rookie of the Year in 2019, and JR Motorsports veteran Justin Allgaier both were impressive in the second C-Feature race before being caught up in wrecks not of their own doing. Both failed to transfer. • NASCAR driver J.J. Yeley, one of the top dirt drivers around, faced a long road to the title race and didn’t get there. He had been disqualified during heat races earlier in the race and was first to start his journey in the O-Feature and work his way up. He made it to the L-Feature before being eliminated after a flip. • StarCom Racing Monster Energy Series driver Landon Cassill also flipped in the L-Feature and was eliminated. • Karsyn Elledge — the 18-year-old daughter of Kelley Earnhardt Miller and niece of Dale Earnhardt Jr. — had impressed on track earlier this week. She won her first heat Saturday, the H-Feature, but flipped in the G-Feature following contact and was eliminated. Well our Chili Bowl ended in the G main. We were looking good in a transfer but can’t control out of control people.🤷🏻‍♀️ Thanks @PristineAuction #KCdrywall and @TBMotorsprts for making my Chili Bowl dream a reality! • Kasey Kahne, who retired from full-time NASCAR competition following 2018, started Saturday in the F-Feature and was eliminated in the E-Feature following a wreck.